Charlie Curry is studying a BSc Geography. She chose UCL because of its London location and global reputation. 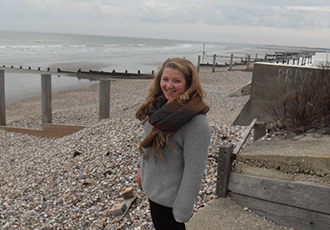 Here she tells us a bit more about her degree and what she hopes to do when she graduates. “The BSc focuses on a huge range of topics, including hydrology in the developing world, to coastal environments, freshwater ecosystems and paleoclimatology. The course is so flexible allowing you to focus on purely physical geography modules or dabble in some human modules if that also takes your fancy. “The course also gives you the opportunity to take modules outside of the Department. I took a geology module in my first year, for example. The dissertation, completed in third year, allows you to specialise and engage with a topic which really takes your interest and has been one of the highlights of my degree! “The two field classes (Mallorca and Greece) were amazing. The practical experience gained in the field supports and enhances the theories discussed in lectures. Also, I may be the only person to say this but I also thoroughly enjoyed my dissertation as it allowed me to specialise. “I have gained a huge range of skills from my degree. Firstly, I have gained experience in a number of different geographical programmes, including GIS, MIKE SHE and STELLA. Furthermore, I have learnt a number of techniques in excel and have gained the ability to write in a series of different formats including reports, informal blogs and literature reviews. “I am hoping to stay at UCL to complete a Masters in Climate Change. The teaching and the support from the Department has been so good I can’t bear to leave! Once I’ve completed my studies, I’d like to have a career in climate change research. “Apply now! You won’t regret it!"